Iceland has been a very isolated and linguistically homogeneous island historically, but has nevertheless been home to several languages. Gaelic was the native language to many of the early Icelanders. Although the Icelandic or Norse language prevails, northern trade routes brought German, English, Dutch, French and Basque to Iceland. Some merchants and clergymen settled in Iceland throughout the centuries, leaving their mark on culture, but linguistically mainly trade, nautical, and religious terms. Excluding these and Latin words, Icelandic has been altered remarkably little since settlement. 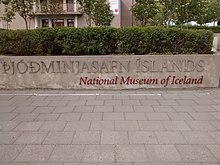 Icelandic is not only the national language, but is now “the official language in Iceland” by virtue of Act No 61/2011, adopted by parliament in 2011. Icelandic Sign Language was also officially recognised by law in 2011 as a minority language with constitutional rights and the first language of the Icelandic deaf community. During the time of Danish rule, Danish was a minority language in Iceland, although it is nowadays only spoken by a small number of immigrants. Studying English and Danish (or another Scandinavian language) is mandatory for students in compulsory schools and also part of many secondary-level study programmes, so knowledge of the two languages is widespread. Other foreign languages frequently studied include German, Spanish and French. Temporary visitors and residents often make up a large portion of the population, especially in the capital Reykjavík. ^ "Act [No 61/2011] on the status of the Icelandic language and Icelandic sign language" (PDF). Ministry of Education, Science and Culture. p. 1. Retrieved 15 April 2014. Article 1; National language – official language; Icelandic is the national language of the Icelandic people and the official language in Iceland. ^ "Iceland And The Rest Of The World" (PDF). The Reykjavík Grapevine. p. 1. Retrieved 15 April 2014. Icelandic towns were essentially turning Danish; the merchant class was Danish and well off Icelanders started speaking their language. ^ The Icelandic National Curriculum Guide for Compulsory Schools (PDF). Ministry of Education, Science and Culture. p. 50. This page was last edited on 19 February 2019, at 04:00 (UTC).